Subaru’s small Crosstrek is big on available advanced safety features. design and numerous changes for 2018. What on earth is Subaru doing?! This once niche automaker is tearing up the market, consistently so since the Great Recession. Subaru continues to expand its product mix and will soon have four lines of utility vehicles when its largest model, the 2019 Ascent rolls out next year. 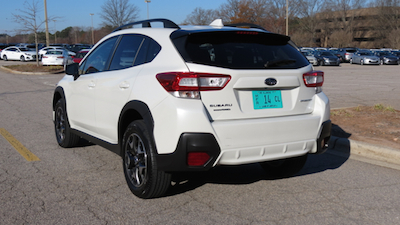 On the other end of the SUV spectrum is the Crosstrek, an all-wheel drive model that hit the market as the XV Crosstrek in 2013. Upon its debut, Subaru offered both standard and gas-electric versions, the latter the company’s first hybrid. The hybrid wasn’t well received. In fact, I wasn’t happy with its fuel economy as mentioned in my review. Subaru stayed with its gas-electric variant for four years. In 2017, the hybrid was gone as was the somewhat confusing “XV” appellation affixed to the beginning of the model name. 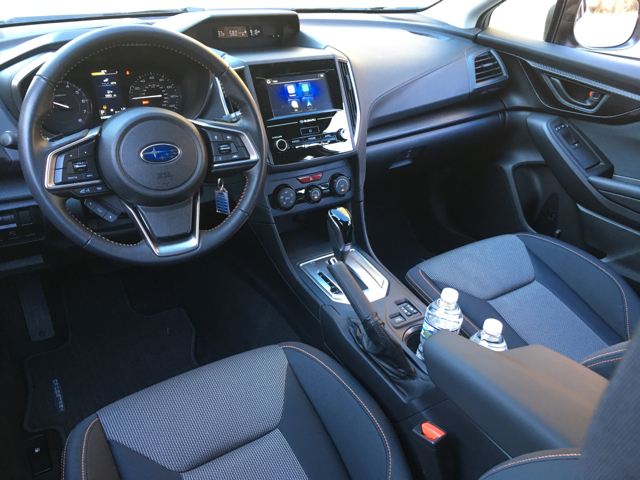 For 2018, the second-generation model rolls out, featuring Subaru’s new design language, a fresh interior, updated technologies — including Android Auto and Apple CarPlay smartphone compatibility, a now standard six-speed manual gearbox and new driver assist technology. 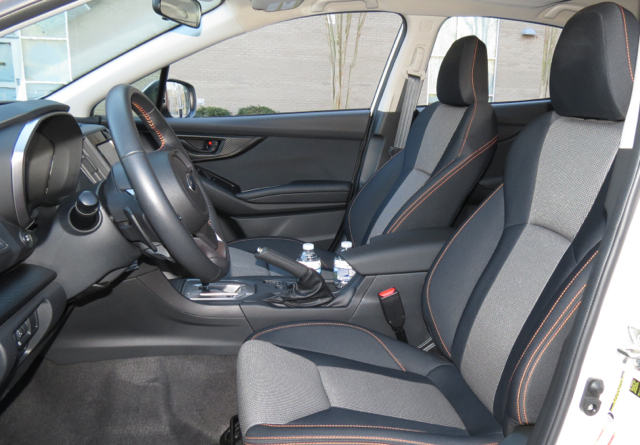 Overall, the Crosstrek aligns closer to other Subaru models in terms of design and available amenities. 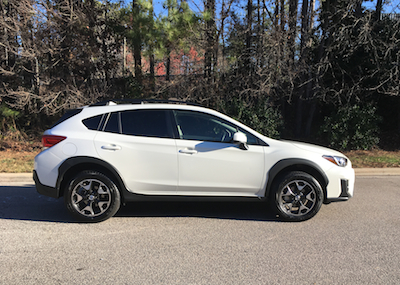 So, what is the Crosstrek? It is rated as a subcompact SUV, although its wagon-like proportions make it seem larger. As such, the Crosstrek’s competitive set includes such models as the Honda HR-V, Jeep Renegade, Nissan Juke, Mazda CX-3, Chevrolet Trax, Mitsubishi Outlander Sport, Toyota CH-R, Fiat 500X and new models on the way from Ford and Nissan. You can also include the Nissan Rogue Sport in the mix, although like the Outlander Sport it occupies the white space between the subcompact and compact range. The Crosstrek is also the only all-wheel drive only model in the mix. That’s a Subaru exclusive, with the rear-wheel drive BRZ the lone exception. One important reason why Subaru continues to snap up market share is its standard all-wheel drive. The system works great, something I was reminded of while driving on a rainy day. More about that later when I cover all things driving. Under the hood of every 2018 Crosstrek is a 2.0-liter four-cylinder engine. It isn’t the traditional inline four, instead the cylinders are pushed to the side for a horizontally-opposed design Subaru continues to utilize exclusively. Only Porsche offers the same design. 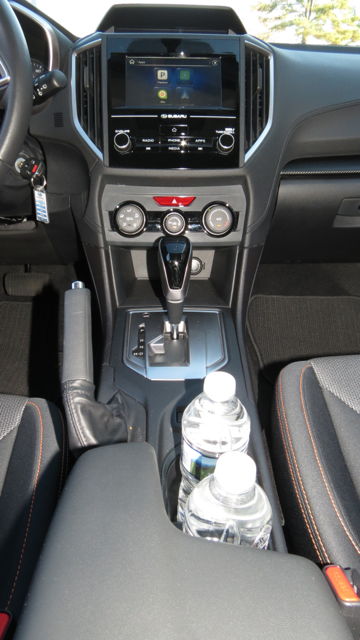 The Crosstrek’s engine makes 152 horsepower and 145 pound-feet of torque. That compares favorably to other models in the class. Subaru pairs this engine with a six-speed manual gearbox or shoppers can choose a continuously variable automatic transmission. 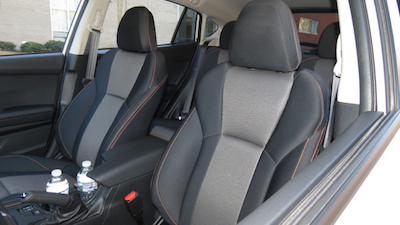 The 2018 Subaru Crosstrek comes in three trims. Pricing, equipment and available packaging follow. Priced from $22,710 (including a $915 destination charge), this model offers halogen headlights, daytime running lights, folding side mirrors, roof rails, a rear spoiler and 17-inch alloy wheels. Inside, you’ll find cloth seats, including a 60/40 split fold-down rear seat, power windows, cruise control, a tilt-and-telescopic steering column, air conditioning, a 6.5-inch color touchscreen and a four-speaker audio system. A rearview camera is standard. Customers may upgrade to the CVT for $1,000. There are no packages available at this trim, although individual items such as a Rockford Fosgate audio upgrade ($499) may be added. Costing $23,510, the Premium is priced just $800 more than the base model. Upgrades include automatic headlights, fog lights, a leather-wrapped steering wheel and shifter knob, illuminated vanity mirrors, cargo cover, rear cargo tray, a six-speaker audio system and a security system. At this trim, a no-charge All-Weather Package comes in, bringing with it heated side mirrors and windshield wiper deicer along with heated front seats. Three extra-cost package options come with models outfitted with the CVT. The EyeSight Driver Assist Technology Package ($1,395) brings in blind spot detection, rear cross-traffic alert, adaptive cruise control, pre-collision braking, lane departure and sway warning, and lane keep assist. Also available is an Optional Package ($1,400) comprised of a moonroof and blind spot detection with rear cross-traffic alert. Combining the two is a third package ($2,395), saving customers $400 when purchased separately. With a price of $27,210, the Limited edition pulls out all the stops. 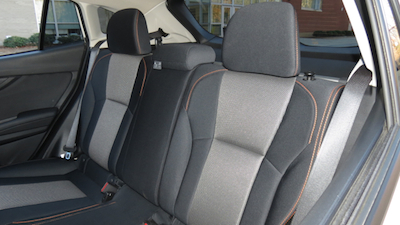 At this trim, the CVT is standard. You’ll also find 18-inch alloy wheels and power-folding side mirrors. Standard interior equipment includes keyless entry with push-button start, paddle shifters, a power driver’s seat, an upgraded instrument panel with a 4.2-inch color display, automatic climate control and an eight-inch color display. You’ll also find two package choices: EyeSight Driver Assist Technology ($2,095) and an Optional Package ($3,495), which builds on the base package and adds an eight-speaker Harman Kardon audio package. Take to the road with the Subaru Crosstrek and you’ll begin to understand how well this or any other Subaru operates, especially when road conditions are wet. I had the fortunate experience of driving the Crosstrek during wet conditions, appreciating both its modest kick and handling. The 2018 Crosstrek imbues confidence on wet roads as power moves as they say “from the wheels that slip to the wheels that grip.” Three hours of driving in conditions that were at times hazardous proved the Subaru’s competence. Steering is light to the touch, while braking is firm. The Crosstrek shines when operating off solid pavement too, at least on dirt and gravel paths. An 8.7-inch ground clearance helps matters as does a new X-MODE. The way this system works is that it decreases accelerator input, resulting in improved control of engine output, for enhanced control wheel-spin for better traction when driving on slick or slippery surfaces. When activated, grip is enhanced and wheel spin reduced by managing the engine, transmission, all-wheel-drive system, brakes, and the Vehicle Dynamics Control System. Ordinary all-wheel-drive systems can’t get you unstuck, while the X-MODE can. The 2018 Crosstrek brings a strong competitor to the segment, with a standard all-wheel drive edge that no other model has. Its X-MODE switch gives it off-road capabilities that approach the Jeep Renegade, although rock climbing is out of the question. Our pick of three trims is the Premium with the CVT and the combined EyeSight and Optional packages, bringing your total price to about $27,000 and that’s before discounts. 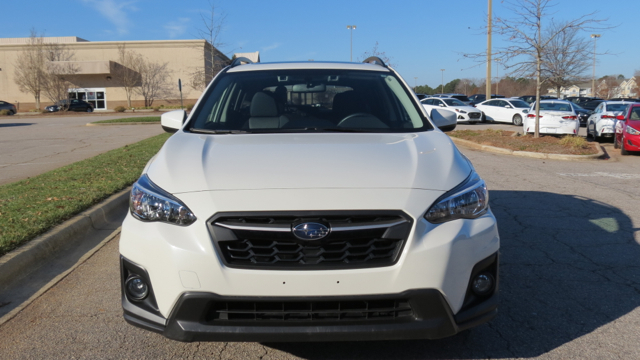 Otherwise, if you need slightly more space and a more powerful engine, consider the Subaru Forester, starting just $1,000 more than the Crosstrek. 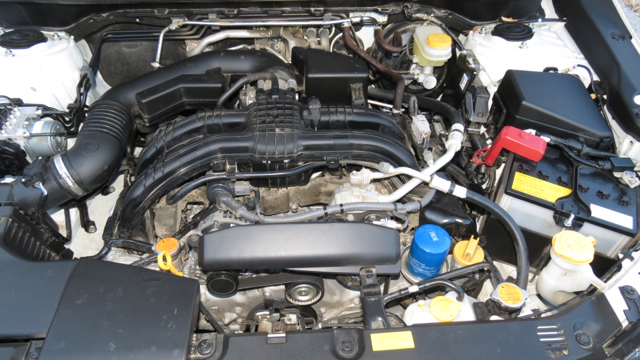 Subaru’s horizontally-opposed or BOXER engine. Photos copyright Auto Trends Magazine. All rights reserved. Matt Keegan has maintained his love for cars ever since his father taught him kicking tires can be one way to uncover a problem with a vehicle’s suspension system. He since moved on to learn a few things about coefficient of drag, G-forces, toe-heel shifting, and how to work the crazy infotainment system in some random weekly driver. Matt is a member of the Washington Automotive Press Association and is a contributor to various print and online media sources.